Twenty years after NASA’s iconic 'Pillars of Creation' image captured a series of gaseous columns stretching an astonishing five light years high, the space agency has recaptured the same scene and rendered it in high-definition. 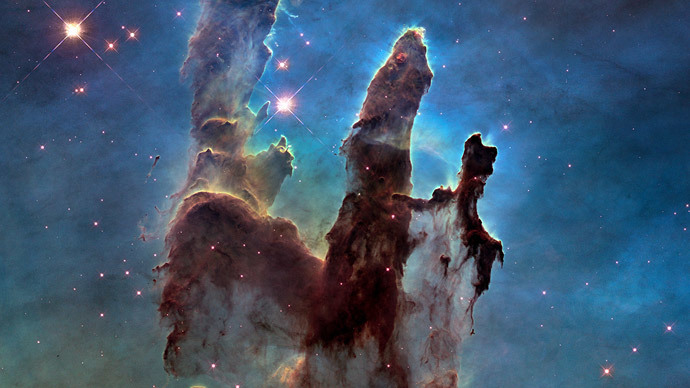 Originally taken in 1995 by the Hubble Space Telescope, the Pillars of Creation image depicts the massive gas clouds spreading across a small region of the Eagle Nebula, also known as M16, located about 6,500 light years away from Earth. The clouds are impressive on their own, but what makes the image even more unique is that the pillars are bathed in ultraviolet light coming from a cluster of massive stars. NASA decided to remake the image as part of the 25th anniversary celebration of the Hubble’s launch, which comes around this April. The agency recaptured the scene in both visible and infrared light, creating an image far more detailed than the previous one. As noted by NASA, new stars can now be seen being born inside the pillars. Additionally, new details from the image indicate that, in addition to showcasing a region giving birth to new stars, the pillars are also being destroyed by the very star light they are bathed in. “The ghostly bluish haze around the dense edges of the pillars is material getting heated up and evaporating away into space. We have caught these pillars at a very unique and short-lived moment in their evolution,” said Paul Scowen of Arizona State University in Tempe on NASA’s website. The top edges of the pillars, particularly the pillar on the left, reveal space matter that is currently being blasted away by radiation from the nearby star cluster. As amazing as the new image looks, perhaps just as interesting is the fact that what people are looking at now, in high-definition, may not actually exist anymore. According to data from NASA’s Spitzer Space Telescope, the pillars may have actually collapsed some 6,000 years ago after a star exploded. The only reason we are able to see the pillars at all is because of how far away they are from Earth. “Because light from this region takes 7,000 years to reach Earth, we won't be able to capture photos of the destruction for another 1,000 years or so,” wrote Whitney Clavin of NASA’s Jet Propulsion Laboratory. Notably, NASA also said that our sun probably formed in a star-forming region very similar to the one captured in the Pillars of Creation image, since it would have needed the kind of strong radiation that blasted the pillars away to be born.